As we make plans for our joint conference with the Katherine Mansfield Society in California next July, we might like to remember the first journey of ‘Elizabeth’ von Arnim, the Countess Russell, to this area one hundred years ago. On 27th September 1916, she left Liverpool docks on the S S Adriatic, bound for New York on a journey that was not without wartime hazards, for on the following day, the ship was chased by a German submarine as it left British waters. Desperate for comfort after a summer of despair over the state of her second marriage to Lord Francis Russell, she had decided to cross the Atlantic to spend time with her second daughter Liebet who, together with her oldest daughter Evi, had left England for a new life in the United States. The ship docked in New York on 5th October, where ‘Elizabeth’ was met by Liebet and a friend, Mrs Jane Whitehead. Mrs Whitehead and her husband lived at the Arts and Crafts settlement, Byrdcliffe, in the Catskills and were able to lend ‘Elizabeth’ and her daughter a cottage there. After a fortnight in this interesting and therapeutic environment, Mrs Whitehead’s descriptions of the idyllic location of their second residence in California persuaded them to journey on by train, eventually taking the famous trans-continental route from Chicago to Santa Fe. This mode of slow transport, unfortunately not practical to us as we make our way to California by plane, allowed ‘Elizabeth’ time to absorb the changes in climate as they passed across the country. 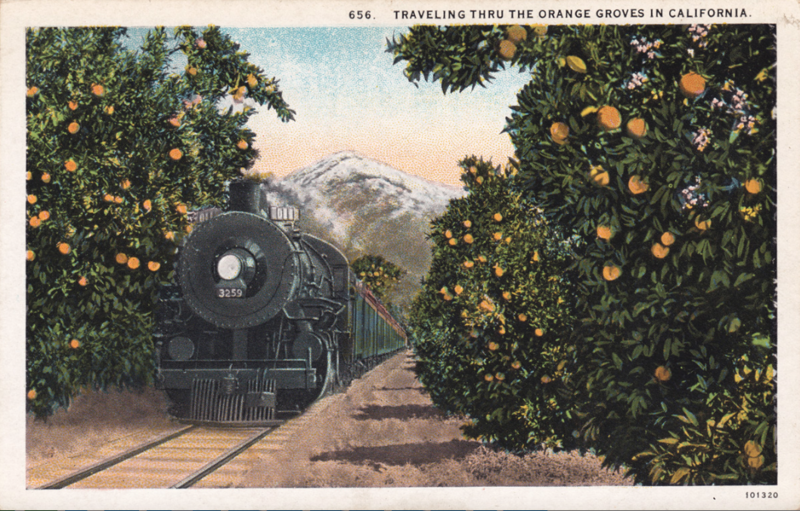 She was able to make use of this when she came to write her novel, Christopher and Columbus (1919), which includes a magical description of the transformation in scenery and climate that occurs on arrival at San Bernardino. This, for ‘Elizabeth’, was where winter ended and the beginning of warmth, light and hope began. I would advise anyone travelling to our conference to read this book, and to share with ‘Elizabeth’ the joy of arrival in such a beautiful place. And it is worth remembering too that Liebet met her future husband during this time, thus beginning the von Arnim connections with California. This article reminded me of my great grandfather’s journey from London to Vancouver in 1880. It was such a different day back then. Really loved your story and look forward to more.